Medallion of Havaiti Nui. – The Art of Affecting Consciousness. Artwork commissioned by Kawika McKeague for the people of Hawaii, New Zealand and Easter Island. They are represented at the 3 points of the pyramid. The waters and islands within the pyramid are known as the Pacific triangle of La(e)muria or Muu. Man is represented by the concave square behind the pyramid and at the end of the intersecting lines emerging from the centre of the pyramid. Above each man are hieroglyphic symbols for the 4 gods of Polynesia: Tu, Taniloa, Rono, Tani : water, fire, earth and sky. The rings emerging from the centre represent energy vibrating through and out to the World. The circle of the arrows are in fact the Hala fruit of the Pandanus tree. The outer clockwise circle of large arrows is your movement toward the good for future generations. The inner counter-clockwise circle of smaller arrows represents your genealogy, your pu’u ka mo’o – ancestors of the past who are within us, to always aid and assist. 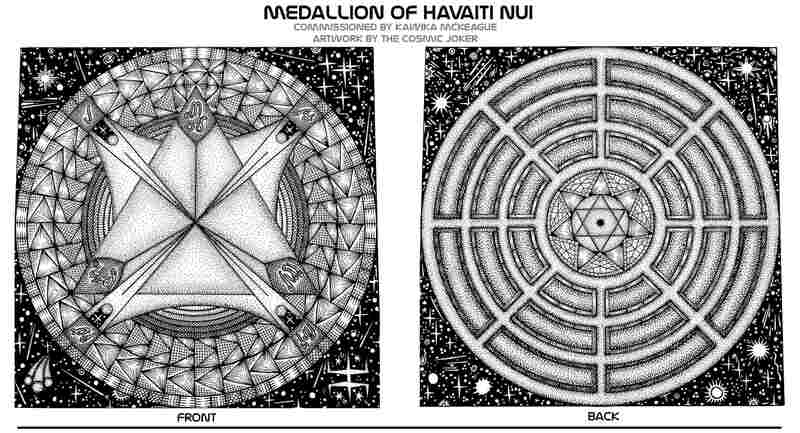 For a more comprehensive explanation of the medallion, front and back, please visit… Hawaiian Prophecies.